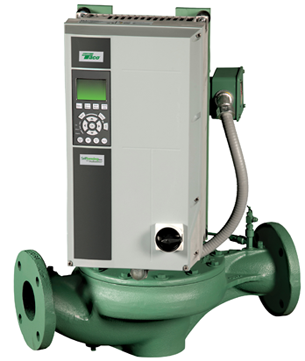 Taco SKV SelfSensing Pumps with ProBalance are a giant leap forward for variable speed pumping. Utilizing the patent pending SelfSensing ProBalance™ technology, the variable frequency drive's SelfSensing capabilities make fast, accurate do-it-yourself system balancing easy. The constant flow mode is self-balancing and automatically adjusts pump speed to maintain a user-defined flow set point. In variable flow mode the pump adapts to system pressure variations and automatically follows the system resistance curve to meet demand. These capabilities allow you to use these pumps for all your pumping needs, both constant flow chiller/boiler pumps and secondary variable flow pumps. In all applications, they help reduce balancing contractor costs, eliminate expensive wiring and the need for problematic external sensors.